Relax and unwind and join us on the beautiful island of Crete. For one week only, we stay at the 3★ Kaissa Beach Hotel, which is located in the lovely resort of Gouves and just minutes away from a pebbly beach. Join your fellow travellers for a week of blissful relaxation. 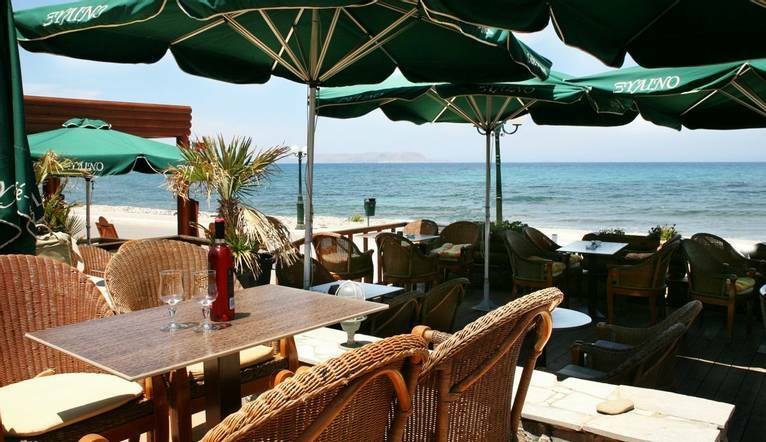 Our hotel is set in an enviable beachfront location of Gouves, on the northern shores of the island of Crete. Gouves; derived from the word “gouva” which means “a hollow in the earth” is a combination of the traditional village of Pano Gouves as well as the seaside town of Kato Gouves. Here, we will find a number of beaches, some as blue flag rated, as well as an array of bars, restaurants and traditional tavernas, all serving tasty local dishes as well as food that will remind us of home. If we wish to relax on the beach rather than the hotel pool, Gouves offers a choice of 3 small sandy beaches, ideal for taking in the warm Greek sun. Our hotel boasts a beautiful beachfront location by a pebble beach; whilst the nearest sandy beach is just a 10 minute walk away. Should we choose to spend our days taking in the beach views, we are spoilt for choice! When we are feeling peckish a number of cafés and beach bars are close where we can taste a variety of food. Crete has more to offer than just beaches and tavernas. The main town of Heraklion is a short bus ride away. Alternatively why not take the opportunity to discover the traditional Cretan life with a number optional tours. Explore the Bronze Age site of Knossos or head across to the captivating island of Spinalonga; one of the last leper colonies in Europe and its Venetian fort. Our charming hotel is ideally located by a pebble beach, offering great views of the mountains and a short walk away from the sandy beach. Facilities at our hotel include a Main restaurant, A la carte restaurant, Pool bar and Outdoor fresh water swimming pool. Free Wi-Fi is available in the pool bar, lobby and restaurant. Transfer time from Chania Airport to the Sunny Bay Hotel is approximately 50 minutes. You may wish to take an optional excursion during the course of your stay. Full details will be given at the Information Meeting. The prices quoted, are a guideline only, as these can vary, depending on numbers etc. All tours should be paid for in euros. Credit cards are not accepted. The exact amount will be given at your Information Meeting. Your Tour Leader will help arrange these for you but may not necessarily accompany you. A full day excursion to this island where you can see the ruins of an ancient fortress and swim in the crystal clear waters of the wonderful lagoon of Balos. Lunch is not included in the price, but food is available on the boat. There is often confusion on the question of gratuities, since it frequently depends on the type of holiday, location and, of course, your attitude towards tipping, as to what is normally expected. In order to give you a rough idea, we have given appropriate guidance below. Your Tour Leader will be on hand to offer advice or suggestions if required but gratuities are offered entirely at the sole discretion of the individual. We suggest a group collection to cover drivers, porters and hotel staff of €15.00 per week. Your Tour Leader will collect this on your behalf and distribute it accordingly, thus relieving you of the burden of who, when and how much to tip. The tipping of housekeeping will be left to your individual discretion (a small amount left in your room on departure should cover this and would be much appreciated). As is customary, ‘the hat’ will be passed around for the driver and guide on all optional excursions. For any meals that are not included in your itinerary, or taxi fares, your Tour Leader can advise of an appropriate add on. Casual, cotton, lightweight daytime wear is the order of the day. Comfortable shoes are a must for sightseeing. Smart casual clothes will be ideal for the evening. Early and late season evenings can be cool so do ensure that you take a cardigan or jacket and even some rainwear – particularly in May and June when you may experience some spring thunderstorms followed by scorching days!